My husband does not like the beige walls in his bathroom. We wish to retain the dark brown shower curtain and bath set. The sink and tub are kind of a creamy off white. The toilet is white. The floor tile is a mottled beige. What wall color would you suggest? If it would not make the room too dark, what about a brown a few shades lighter than the shower set? A golden yellow or medium green could also work. Turquoise and brown is another possibility. Hope this helps. And my color would be to go black. Sort of a reverse negative. I accented my bright green sewing/crafting/computer room with BLACK. O M G. Thought I was nuts with the green, then add the black? But it works great! Curtains, etc. So a black wall.....backspace for alot of contrast items. With the bathroom being so full of neutrals, the best way would be to add a splash of color. Almost any color will go well with browns, beiges and whites. I would choose something warm. What is his favorite color? Soft blues go well with browns. Google brown and blue bathrooms and you will get tons of ideas. Light green or light blue would look nice and coordinate well with the remaining colors. I would look at blue tones. They always look good with brown and cream. They are quiet but not boring. Good luck. 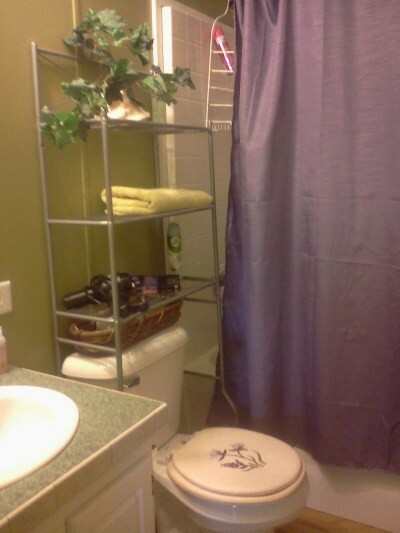 We primed and painted over vinyl wall covering with an 'almost' grass green with purple shower curtains. The toilet seat had both colors. Everything else is white. If you paint the walls a creamy off white, you will be able to change the colors of your bathroom any time you wish.